I'm not much of a "car guy," but this Exhaust Air Jack seems like a pretty brilliant alternative to your normal jacks. 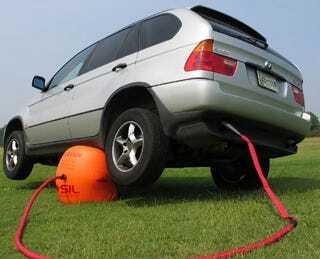 Simply plug the hose into your exhaust pipe, stick the balloon under the frame of the car, and let the exhaust lift the car up so you can change the tire. Apparently, it's strong enough to lift a three-ton vehicle 18 inches for up to 45 minutes, which should be enough time for even the most inept of us to change a tire. Hit the jump for a video of it in action.